Here at Grapevine our dedication to the Viper runs deep, (besides having an owner that has been The Viper Challenge Champion several times!). We have our own Certified High Performance SRT Viper Sales Professional! Feel free to give him a call to discuss this amazing machine. If you have ever thought of owning a Viper, this year’s Viper will push you over the edge! When you begin looking at the 2016/2017 Dodge Viper SRT, GT, and GTS, it’s important to know what to expect. The rough edges that have been seen in previous model years have been traded in for dramatic styling changes. It’s a supercar as far as anyone is concerned and it has more than impressive acceleration as well as handling that would make any professional driver green with envy. The 2017 Viper SRT has dropped “Dodge” from its name in order to show that it is a new and improved machine that demands respect on the streets and track. Its low aggressive stance may in fact do all the talking. Get ready to start salivating when taking a look under the hood for the first time. The huge V10 8.4 Liter engine putting out 645 horsepower and 600 pound feet of torque is absolutely engineered to perfection. With a 0-60 time of 3.3 seconds and a top speed of around 206 miles per hour, I think it’s safe to definitively say that this is a reborn supercar that’s as fun to drive around town as it is to rip around the track with. Like an optical illusion, it’s surprising to see that the cabin is very roomy for its class. The coupe provides head and leg room and even a driver with a height of 6’5″ will be comfortable behind the wheel so anyone in the NBA looking for a supercar with comfort, this could just be your ticket. There are also some impressive ancillary packages offering drivers a more convenient 21st century driving experience. This includes leather throughout the cabin as well as a tech package that offers Bluetooth, an upgraded sound system, and other creature comforts. The Viper is also loaded with the UConnect 8.4 inch Touchscreen navigation and car play system that allows you to easily connect your internet media to the Viper’s sound system and screen so you can be connected with the outside world only as much as you’d like. Bring your soundtrack wherever you’re headed and never feel lost again thanks to the onboard navigation system. Many supercars are able to shine in a straight line but that isn’t the 2016/2017 Viper SRT’s only trick anymore. The newly revamped Stability and Traction Control Modes allows for slight yaw and slip angles suited to spirited track sessions or closed course antics. Even with everything fully disengaged, however, the Viper is surprisingly balanced; transitioning from entry to apex to exit with massive grip and surprising feel through the steering wheel and the seat-bottom. There’s always the threat of the rear coming around when you come onto the gas too hard, but as a training tool, the mortal fear of 600 pound-feet of torque is unmatched. The new Viper suffered a serious black eye when it ranked behind the outgoing Corvette ZR1 in a few big comparison tests, so the SRT crew has been busy refining the model with a new Bilstein DampTronic adjustable suspension, a ‘Rain’ mode on the stability and traction control, and matte-black paint on the new-for-2014 Anodized Carbon Edition as well as another gorgeous and exclusive color, Stryker Green. These improvements help this beast fully engage and instill confidence that the driver can make the clean turns that are needed to stay on the road without having to let off of the gas too much. This monster is truly revolutionary as it corners like a slot car with the heart of a lion.Although negligible, there have been a few negative reviews circulating and it’s important to address what they have to say. The main contention seems to be that it uses a lot of fuel. No kidding, this thing is a fire breathing dragon and I hardly think that true Viper fans lose sleep over the gas mileage they got that day while having the time of their lives. The interior, as some say, is underwhelming. I beg to differ as it is stylish and refined enough in comparison to other cars that are in its price class if you choose to upgrade to the Laguna edition interior, the level of panache rivals even the finest of German and Italian supercars on the market. Some have also criticized the price point because it is an “ex Dodge”. The Viper has evolved like all good things and it shouldn’t receive negative reviews just because of its roots. When comparing what kind of performance you get out of the Viper to the price point, it’s undoubtedly one of the best buys in the supercar realm that one could choose. The 2016/2017 Viper carries on and improves upon its racing and performance pedigree of years gone by and should only be reserved for serious drivers. You’ve been warned. Grapevine Chrysler Dodge Jeep Ram is excited to be the Number one SRT Viper dealership in North Texas and Dennis Thomas is amped up and ready. 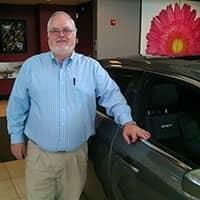 He has over 10 years’ experience with Dodge, Chrysler, Jeep and Ram products and that is why he was the perfect choice to become our High Performance Specialist. Dennis is certified in Viper and ready to begin taking orders. No one is more dedicated to getting the details right and forming long term relationships with his customers to insure satisfaction for you after the purchase of your new SRT Viper. 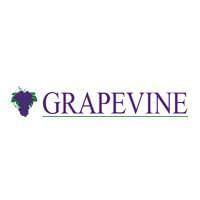 To schedule an appointment please call Dennis Thomas at (817) 410-7541 or email him at dthomas@grapevinedcj.com. The 2017 SRT Viper is all-new, from front-to-back and top-to-bottom, from the lightweight carbon-fiber roof right down to its road-scorching wheels. It features less weight, stiffer chassis, a more powerful engine, beefed-up close-ratio transmission, more powerful brakes and new electronic technology. It's all wrapped in aggressive exterior styling with gorgeous interior design, materials and appointments to make Viper more comfortable and capable, better riding, more agile and faster accelerating to a higher top speed. Advancements in materials and engineering lead to a new output of 645 horsepower and 600 pound-feet of torque. 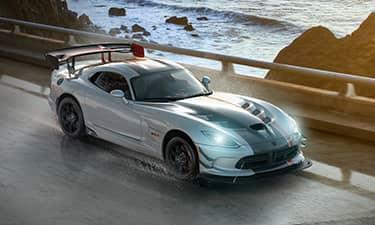 Meet the SRT Viper - The core Viper is a race car with license plates that remains true to its legend. With its classic, tough-and-ready feel, it's focused on the core performance needs of its driver. Greet the SRT Viper GTS - With two-mode suspension, the SRT Viper GTS has great race car handling when you want it, but can also be set for touring on the street. 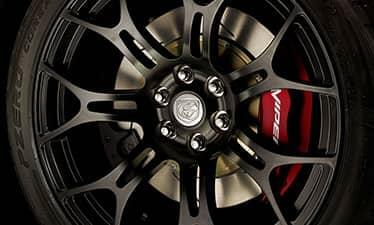 Extreme performance with premium appointments and state-of-the-art electronic controls are all hallmarks of the SRT Viper GTS. The updated, more powerful 8.4-liter V-10 engine and revised close-ratio six-speed manual transmission promises improved acceleration. Functionality and comfort adorn the interior of the Viper with amenities including cruise control, Bluetooth, USB, SD and auxiliary connectivity, automatic temperature control, keyless entry/start, automatic headlamps, electro-chromatic rear view mirror, color touchscreen interface, up to 19-speaker audio system and embedded navigation. 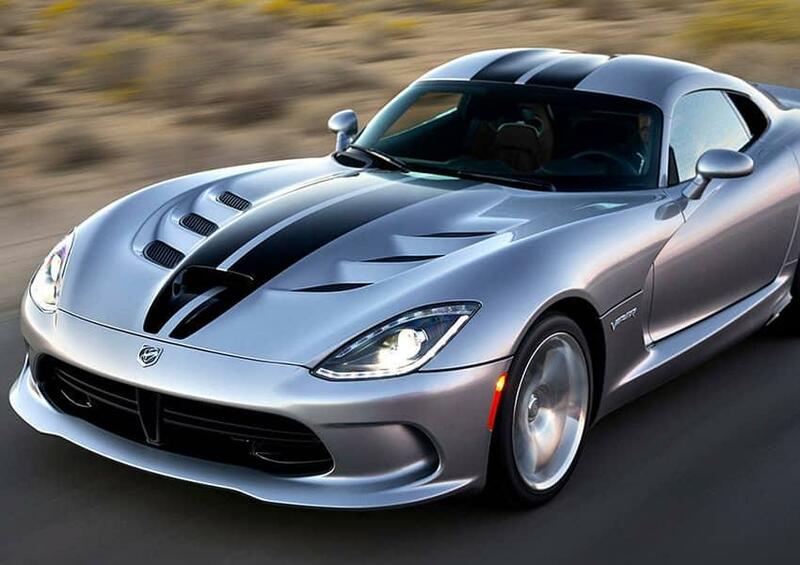 The fifth-generation SRT Viper is the latest and greatest in a long line of Vipers. It keeps its legacy of outright performance while incorporating superior craftsmanship. A host of new technologies and ergonomic improvements are present in a new, more powerful and lighter-weight vehicle. It's the Viper for the 21st century. The 2017 SRT and GT Viper is all-new, from front-to-back and top-to-bottom, from the lightweight carbon-fiber roof right down to its road-scorching wheels. It features less weight, stiffer chassis, a more powerful engine, beefed-up close-ratio transmission, more powerful brakes and new electronic technology. It’s all wrapped in aggressive exterior styling with gorgeous interior design, materials and appointments to make Viper more comfortable and capable, better riding, more agile and faster accelerating to a higher top speed. Advancements in materials and engineering lead to a new output of 645 horsepower and 600 pound-feet of torque. Meet the SRT Viper – The core Viper is a race car with license plates that remains true to its legend. With its classic, tough-and-ready feel, it’s focused on the core performance needs of its driver. 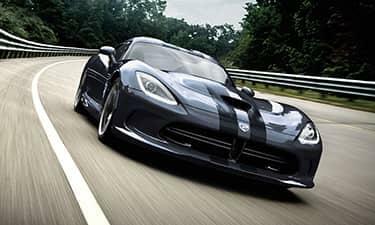 Greet the SRT Viper GTS – With two-mode suspension, the SRT Viper GTS has great race car handling when you want it, but can also be set for touring on the street. Extreme performance with premium appointments and state-of-the-art electronic controls are all hallmarks of the SRT Viper GTS. The updated, more powerful 8.4-liter V-10 engine and revised close-ratio six-speed manual transmission promises improved acceleration. The fifth-generation SRT Viper is the latest and greatest in a long line of Vipers. It keeps its legacy of outright performance while incorporating superior craftsmanship. A host of new technologies and ergonomic improvements are present in a new, more powerful and lighter-weight vehicle. It’s the Viper for the 21st century.